There was a picture in the New York Times recently of the police in Hong Kong, confronting all the demonstrators shutting down major highways in the city. The thing that grabbed my attention was the way the police were dressed. 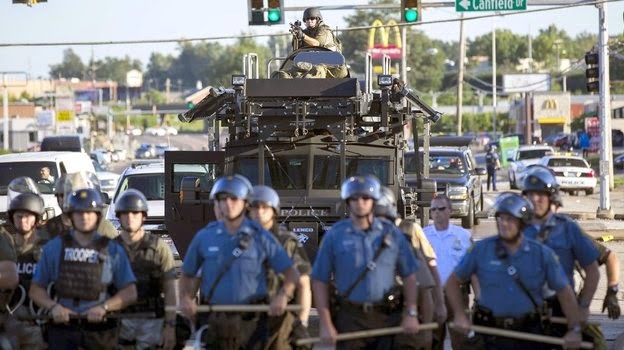 Militarizing the police seems to be international in scope. Plastic shields over the faces makes it hard to know if there's a person in there or not. One can hope the guns they carry shoot rubber bullets, but who can be sure from a distance, especially with the police in camouflage. Probably most Americans would consider the reason for the protests in Hong Kong appropriate, as the demonstrators are challenging the idea of the Chinese government confirming who can run for elective office. 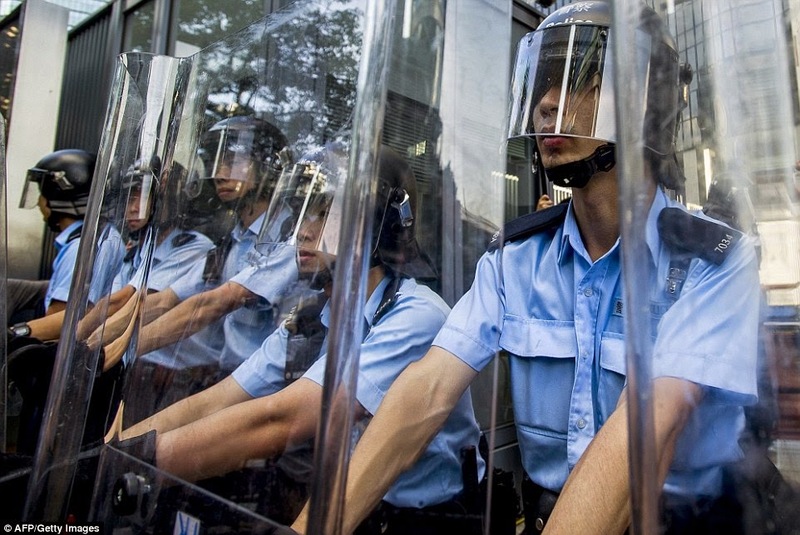 Besides, these demonstrators are in Hong Kong and challenging an admittedly repressive regime. (I read one article where the writer thought folks in the U.S. should be in the streets for the same reason. Considering how much money it takes to run for elective office and how party politics plays such a significant role before anyone goes near a voting booth, the author may have a point). But my concern is what is happening to the traditional role and symbol of the police right here at home. These are the people we have always depended on in cases of accidents on our streets, robberies in our homes, saving folks from natural disasters as well as saving cats in trees. I called them when a young person who had way too much to drink was banging on the doors and windows of our 90 year old neighbor's house yelling she wanted inside. When we had a similar unexpected caller at 2:00 in the morning banging on our door, the police came and gave him a place to sleep it off. And if you read the police logs in the local paper, it's surprising and frightening how often they respond to potential suicides. It's only right that we make our police as safe as possible, especially as more and more guns of every persuasion flood our homes and neighborhoods. But if the way we react to the threat to police is by making them soldiers, with weapons of war, we're only escalating a bad situation into a catastrophic one. Especially when people assemble in constitutionally protected and legitimate protest, facing off with tanks and machine guns, unknowable and unrecognizable officers, drones and barb wire. That will inevitably lead to revolt, not reform. The recent experience in Ferguson, MO is a prime example. A video titled "Call the Cops" came across my desk the other day. It's several minutes of clips of police brutality, all the way back to Rodney King. Many of the victims are people of color, homeless, mentally ill, women. It's performed by Rob Hustle featuring the Bump. There are other similar videos out there and they seem to be multiplying with each new incident. That's not good news for those of us used to appreciating personal relationships with law enforcement. There are certainly other ways of doing things so the violence de-escalates, rather than developing into all out war, which always seems to take more innocent victims than engaged ones. Friends in Monterrey, Mexico have shared plans for bringing police and gang members together in mutual listening sessions. The gang members have agreed. The police have agreed. Instead of simply retreating into their respective war camps, they intend to try understanding the situation of the other, building some potential relationships, and moving beyond violence. 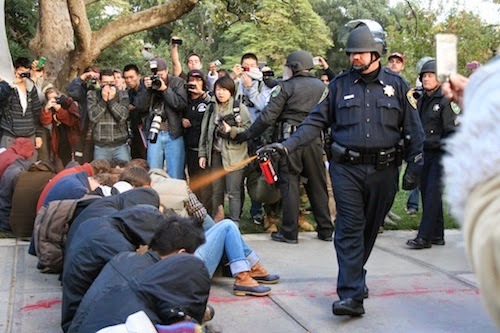 I still recall a video of that student protest at the University of California, Davis. That was the one where all those students sitting nonviolently on the ground were sprayed in the eyes with pepper spray. There was no threat to anyone. They were simply exercising their first amendment rights. In that situation, the police dressed for war eventually had to leave because they were surrounded by hundreds of students upset at their activities and yelling "shame". But there was one officer who had removed his helmet. You could look in his eyes. You could tell when he smiled and when he was unhappy. He was engaging the students around him in dialogue and de-escalating the whole situation. It might have gotten uglier except for him. Fortunately for those of us who live in small towns and cities like Brookings, South Dakota, we can still encounter persons behind the badge. They are usually neighbors, not just hired hands or hired guns. Police work is risky business. So is publicly exercising democratic rights. There are tried and true ways of keeping the peace while protecting the citizens and respecting their rights. Just because we seem to have adopted perpetual and pervasive war overseas, it's no good reason we have to bring it home. But there's an old saying, "the chickens come home to roost."